Duval Fence Company provides only the highest quality vinyl fences to the Jacksonville and surronding Duval County area including Orange Park, Mandarin, Arlington, Jacksonville Beaches, Ponte Vedra, St. Augustine, Duval County, Clay County and St. Johns County. Vinyl Fences have the lowest maintenance fence style you can buy. Vinyl fences have grown exponentially in popularity. Vinyl fences are inexpensive, very durable, and extremely easy to maintain. Unlike wood fences that over their life span may fade in color and due to weather may rot, or metal fences that might rust under extreme weather conditions or just over time, vinyl fences only require a wash up every so often to keep them looking the same as they did when they were installed. Vinyl Fences are Easily customized. Vinyl fences are very versitile with many uses some of which are: property fence, privacy fence, pool fence, or pet fence. Some of the many variables about vinyl fence is it has the ability to be painted to match the exterior of your home. Although the classic white does look great. 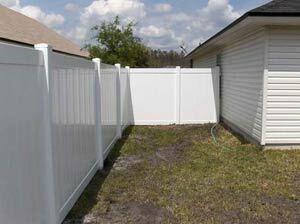 Contact Duval Fence today (904) 260-4747 or by email to get a free estimate on a new vinyl fence!